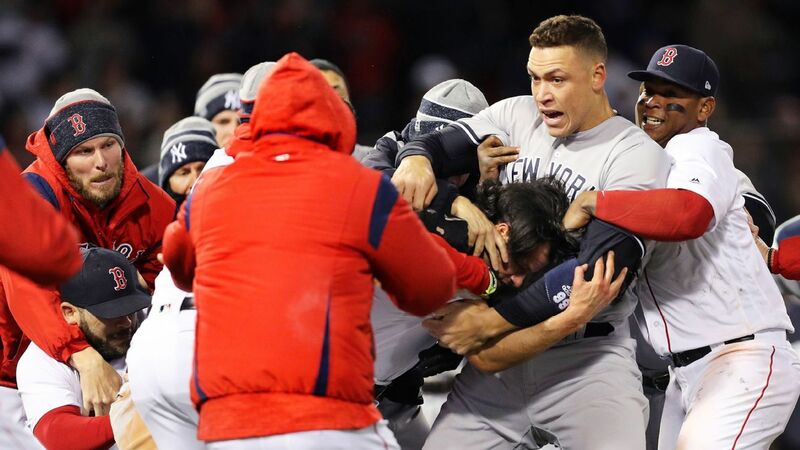 Tyler Austin rushed the mound after being hit by a pitch from Red Sox reliever Joe Kelly, triggering a bench-clearing brawl in a ramped-up rivalry as the New York Yankees ended Boston’s nine-game winning streak with a 10-7 victory Wednesday night. Gary Sanchez hit two home runs in a game that twice saw the benches empty and a fight that resulted in a trio of ejections. With the Yankees leading 10-6 in the seventh, Kelly nearly hit Austin and then caught him on the side with a 2-1 pitch clocked at 98 mph. Austin slammed his bat on the plate, threw it down and took four steps toward the mound while hollering. Kelly waved Austin at him, and things quickly escalated.